Though the plastic pyrolysis oil from plastic waste has many applications, it still can’t be used in engines directly. In order to further refine the waste plastic to diesel that has wider applications and higher price, we have designed the waste plastic to diesel machine for sale. 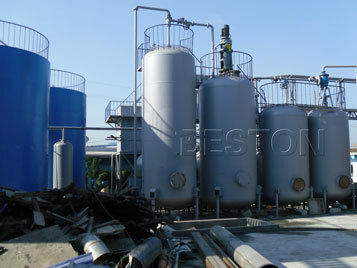 The plastic to diesel plant adopts a kind of technology called distillation or refining. This technology takes advantage of high temperature and heat the plastic oil to working temperature by using fuel oil, gas, coal etc. as fuel materials. Through changing forms of the oil from liquid state to gaseous state and then from gaseous state to liquid state, the distillation technology can successfully remove the particles, colloidal matter, acid and odour from plastic oil by acid-treatment and filtration. Finally we get qualified diesel oil with clean and transparent color and qualified smell. Having high economic values, these diesel oil can be widely used in low speed engine and generators such as digging machine, road roller, loading machine and so on. The valuable final products will rapidly get your plastic to diesel plant cost back soon and bring you great profits. (1) All the plants are certified by CE, SGS and ISO. (6) Automatic submerged welding technology, ultrasonic nondestructive testing, guarantee the equipment quality. (7) Oil pump feeding and discharging, save much manpower. Now, we have manufactured two models of plastic waste to diesel machines to meet different customers’ demands, and their capacities range from 6t/d to 10t/d. You can choose batch operating sytstem. If you want the larger capacity, we can customize the plastic to diesel machine for you as well. The heating system of plastic to diesel fuel plant consists of fuel tank, fuel burner, heating furnace and so on. The heating system has the advantages of high heating efficiency, small heat loss and high heating speed, etc. The fuel burner can control the size of input heat energy, so as to ensure the stability of the whole plastic to diesel system. 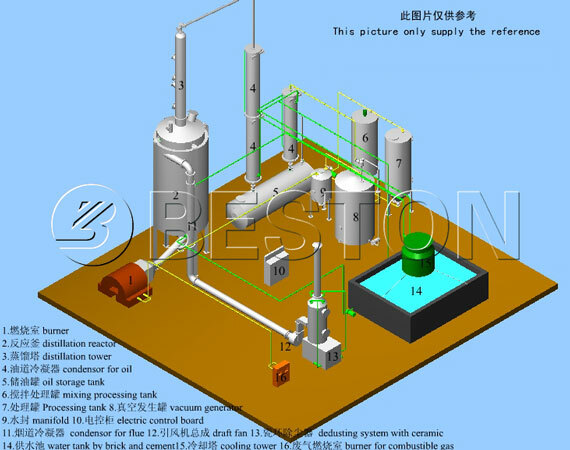 The plastic to diesel system consists of distillation reactor, distillation tower, cyclone settling tank, condenser, oil storage tank. The distillation reactor itself is not heated in the system. The heating of raw materials is completed by heating furnace. 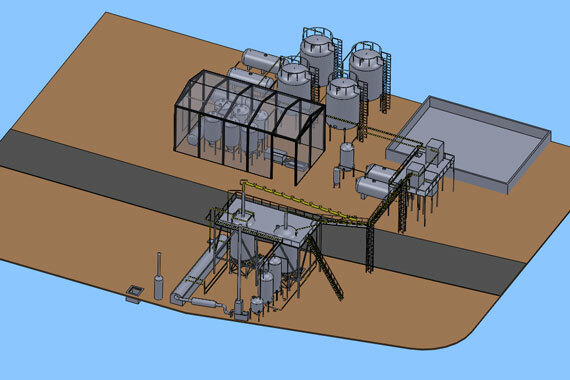 The raw materials in the reactor is heated in the furnace to reach the required distillation temperature; the unique structure design in the distillation tower greatly improves the quality of resulting fraction; the cyclone settling tank can precipitate most of the ash in the oil and gas to reduce the impurity of the resulting fraction; the condenser design adopts tube condenser, and both of the ends can be easily opened, which is easy to clean up in the daily maintenance. The system consists of vacuum buffer tank and vacuum pump. 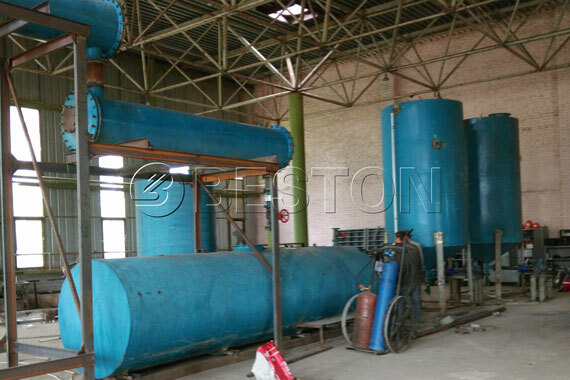 This unit belongs to negative pressure distillation, which can greatly reduce the distillation temperature. In this way, it can not only reduce energy consumption, but also can greatly improve the production and oil quality of single unit. 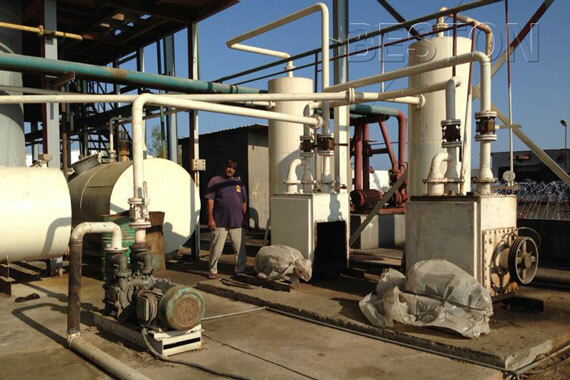 This system includes gas water tank and tempering device. It can complete the non-condensable exhaust gas recovery in the heating furnace for combustion use, which both can solve the direct emissions of environmental pollution, and save fuel in the plastic to diesel process to a large extent. It consists of lye tank, tower spray desulfurization dust, induced draft and other components. The system can not only make the emission of flue gas achieve white, but also can make the sulfur dioxide contained in the flue gas from the spray lye to complete the acid and alkali and then meet related standards. This part consists of digital control cabinet, parameter field collector and other components. The parameters of temperature, pressure, liquid level in each unit can be displayed in the cabinet. The system also has the display function of over-temperature, over-pressure and low and high liquid level, which has greatly reduced the rick and waste caused by human factors.